I have a ten-year old son. Now that he's all grown up, it was time to get him a desk for his bedroom. Along with the desk came a need for a desk lamp. The timing couldn't have been better as I was asked to review a reading lamp from BenQ. The BenQ e-Reading LED Desk Lamp is a rather large rotating lamp that goes around and tilts up-and-down, in-and-out thanks to a ball joint to give you a wide range of coverage. 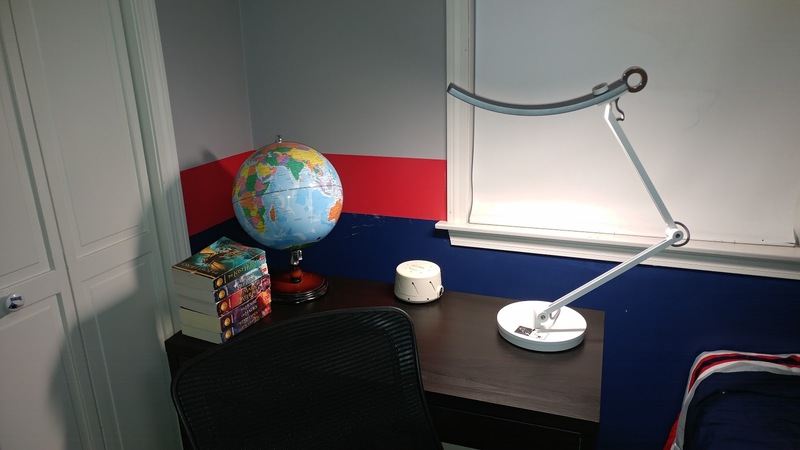 The light part at the top offers a 35" wide light range and provides more than enough lighting for your typical homework / reading needs at a typical desk. For the desk we just purchased, the lamp overshadows the desk as lamp is over-sized. BenQ does offer a smaller model, too, if this is too large. Besides size, the lamp provides some interesting lighting options. While it doesn't exactly offer multiple color lights, it does offer multiple shades of white lighting. You can go from a warm white light to a cool white light with a couple taps and turns of the selection knob. If you have different lighting needs based upon the task at hand, you won't have to swap out multiple lamps. There isn't exactly an on-off switch, instead, all you have to do is tap on the top of the arm. This takes a little getting used to for someone my age but my ten-year old adapted to easily. The lamp checks in at a price point of $189 over at Amazon. You have multiple choices of colors for the base and top of the light. We chose the silver variety, though could have gone with a red, white, green, or gold model instead, plus some others. Some were out of stock at our time of ordering so, if the stock situation remains, you would either need to wait for the color you desire or select a different model. My son loves both his new IKEA desk and the BenQ lamp. I frequently find him playing with all the different lighting shades available and just tapping away, turning the light on and off. I suspect he'll get bored with the novelty of the on-and-off tapping at some point, but for now it is something he enjoys. 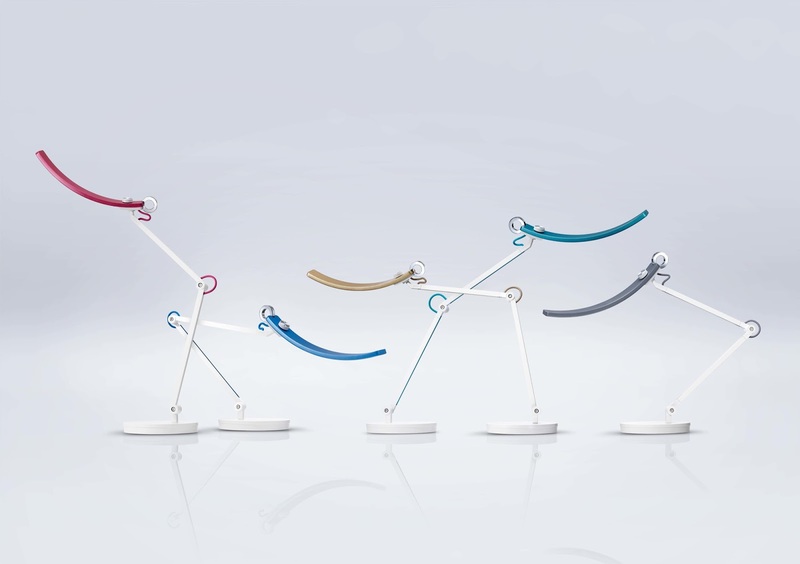 Now, here's your chance to win your own lamp in your choice of colors. 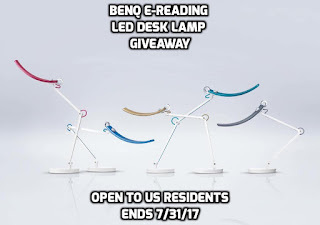 The giveaway is open to US residents only aged 18+ and ends at 11:59pm EDT on 7/31/17. See Giveaway Rules for additional rule details. Disclosure: Java John Z's and participating bloggers are not responsible for sponsor prize shipment. John John Z's received a lamp for the purpose of this review. All opinions states are his own and may differ from your own. Please see the disclosure policy for more information. I like the silver desk lamp the best. As far as I can tell the only different variety is the colors. The gold is really nice too. I like the silver desk lamp would go perfect on my desk where we do my sons homeschooling. I like the desk lamp in silver. I love the lamp that they list as green. It looks like a lovely blue grey to me. 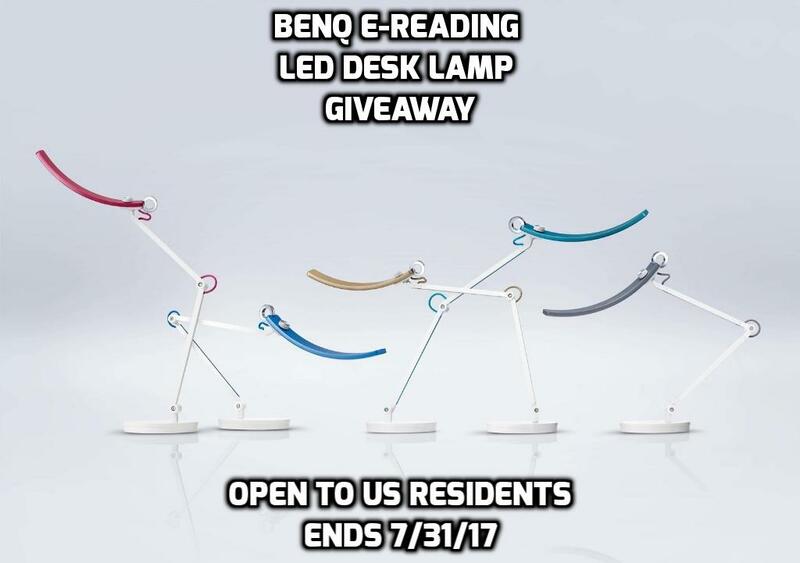 For some reason, my entire family often asks "wheres a lamp, I cant see..." and one of the answers could come when winning a prize like that of the BenQ e-Reading LED Desk Lamp! As I read more, the more I loved this World's First Desk Lamp for Monitors - Perfect for Designers, Engineers, Architects, Studying, Gaming - Green!As I looked at that of the colors.... Blue seemed to be ideal in which it would match my scenery around my residence! Another light went on; I think it would be wonderful to share this with other's - you? Well theres many that can use this item so I send you all that of the very best of luck! I like the desk lamp in silver. It will be great for my computer at work. The BenQ e-Reading LED Desk Lamp - World's First Desk Lamp for Monitors - Modern, Ergonomic, Dimmable, Warm/ Cool White is very nice! Intelligent e-Reading Mode: Built-in sensor to detect ambient lighting and deliver the perfect illumination for working in front of digital screens. 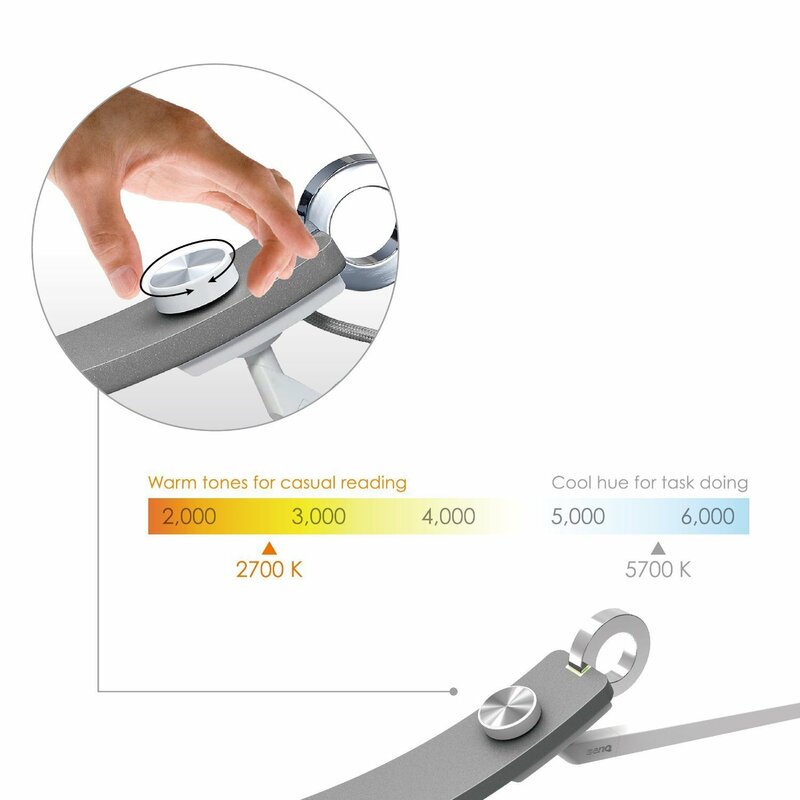 Warm/ cool color adjustment with continuous dimming control. So I can use it with my Kindle. I like the BenQ e-Reading LED Desk Lamp in Blue. I like the one in red. Very attractive. I like the Built-in sensor to detect ambient lighting and deliver the perfect illumination needed feature. I like the Smart Lighting feature! I like the SMART LIGHTING feature that senses ambient light. I like that you can get different shades of light. I like that this light can adjust the light to the exact angles you need. I like that the LED panels will give you 50,000 hours of lifespan. I LOVE the design of this light! But I think my favorite feature of it is the 50,000 hour lifespan! The feature that I like the most is that the Lamp can be dimmed for your reading preference. I like that it lets you adjust the lighting for your "mood". I like the mood light for relaxation. I like that you can adjust the lighting ! I like the ZEROFLICKER technology. What a neat lamp!! There are several features I really like. As I am changing light bulbs in two different rooms in my home presently I think the LED panels that give 50,000 hours of lifespan is my favorite. That’s 8 hours a day, for 17 years! That is amazing. I like how one can switch the tones for different activities. I like that you can change the tone of the lighting. I really like the mood lighting and the broader coverage. Thanks for the super giveaway opportunity. I like that it can be switched from warm tones to casual reading to the cooler tones. This is really very cool. I like that there is a variety of colors! I like that The BenQ e-Reading lamp has a built-in ambient sensor. With a longer touch of the control ring, the sensor automatically detects the light levels of the room and adjusts its brightness accordingly. different shades of light and mood lighting. My favorite is the BenQ e-Reading LED Desk Lamp in silver, although I would be happy to get it in any color. 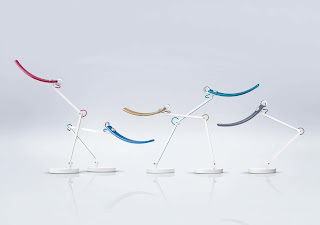 I really love the unique options available with this lamp, & feel that my daughter would enjoy it endlessly. I can envision our nighttime reading enjoyed with this lamp! I like that its LED panels will give you 50,000 hours of lifespan. I really like the mood lighting and the adjust-ability. Wow this is such an awesome giveaway! I've been on the hunt for an effective, yet small reading light/lamp since I live in a small space at the moment. It's obvious that the brightness adjustment knob is super convenient, but I see you can buy attachments to make it a clip-on light or even a floor lamp! That's so unique. This light has it all! I like that it can be adjusted. Sometimes you need brighter, or a little more warmth for mood. I like the flexibility of both the shades of white and the range of area to be lit. I like that you can change from warm to cool for light settings. the adjustable arm and head of the lamp is my favorite feature. The smart lighting is my favorite feature. 150% WIDER: Delivers a 150% wider lighting coverage, creating an illuminated area in at a 35-inch light range and an illuminance of 1800 lux is my favorite feature. I love the idea of smart lighting! This is awesome! I like that you can make the light warmer for reading! I like the 17 year LED lifespan and the fact that it is flicker free. I like the SMART LIGHTING feature. It takes the guess workout from trying to figure the right brightness in the room. I like the long-lasting lifespan of the LED light. I really like the mood lighting. Wow the LED life is outstanding. I also think the Zeroflicker is nice. That supposedly drains our energy. i like that you can switch it to warm tones for reading. the lifespan is impressive too! I like the smart lighting feature.